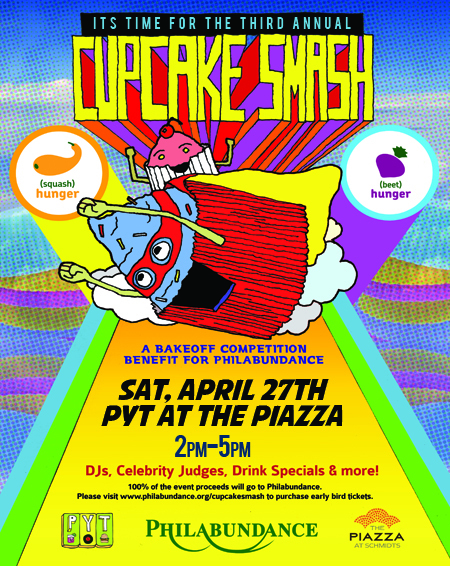 Philabundance, the Delaware Valley’s largest hunger relief organization, is throwing the third annual Cupcake Smash at The Piazza at Schmidts on Saturday, April 27th from 2pm-5pm. Philabundance and PYT are joining forces with The Piazza to raise money for people in need of food in the Delaware Valley. Professional and amateur bakers alike will vie for the tastiest PYT themed cupcake to be deemed #1 by celebrity judges and the “People’s Choice.” All proceeds benefit Philabundance. Cupcake Smash will be held in the middle of The Piazza with Wendy Rollins, Radio Host on Radio 104.5 emceeing. Celebrity judges include Nima Etemadi and Lily Fischer, co-owners of A Cupcake Wonderland and winners of the Food Network’s Cupcake Wars, Zoë Lukas, owner of Whipped Bake Shop, Caroline Russock, food editor of Philadelphia’s City Paper , Tommy Up of PYT, Chef Nathan Volz of 10 Arts Bistro & Lounge, Wendy Rollins and Tony Luke Jr., of Tony Luke’s. Judges will vote on the best cupcake for the amateur and professional categories, while attendees will vote for the “People’s Choice”. DJ Jay Yo will be on the ones and twos while complimentary beverages and snacks will be provided by Barefoot Wine & Bubbly, KIND Healthy Snacks, Pabst Blue Ribbon, Philadelphia Distilling, and White Mule Farms Spodee. Philabundance is experiencing 29 percent more people coming to them for food compared to last year and a 98 percent increase in need over the last three years which is why community support is needed more now than ever before. Last year’s Cupcake Smash raised more than $7,600 for Philabundance helping them provide more than 15,000 meals to people in need, surpassing the 10,000 meal goal and doubling the amount of meals provided the inaugural year of Cupcake Smash. The goal for the third annual Cupcake Smash is to raise enough money to provide 20,000 meals to people struggling to put food on the table.